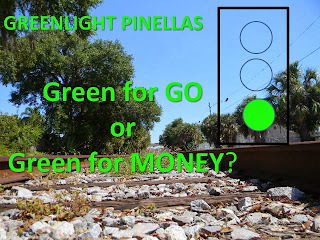 Beginning today and continuing on future Fridays I take a look at GreenLight Pinellas and the sales tax referendum to support Pinellas County Public transportation. 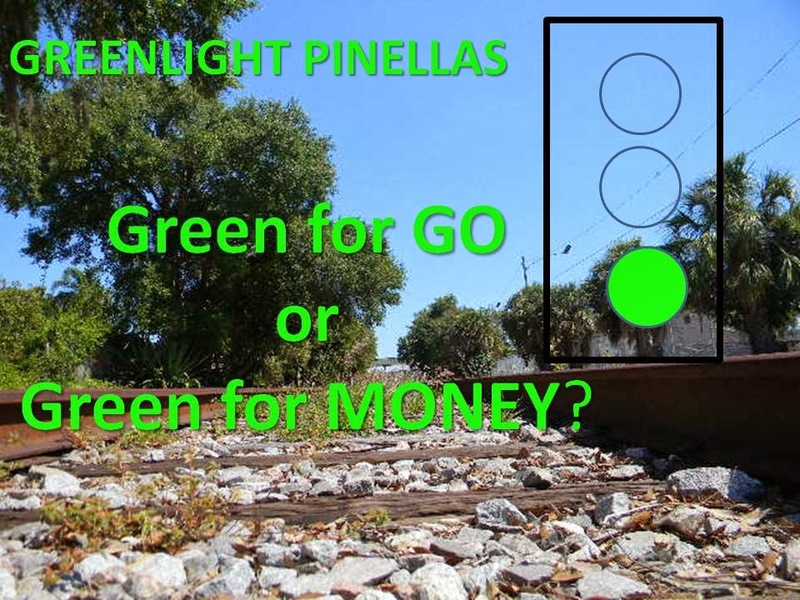 GreenLight Pinellas is the public relations arm put together to promote the transportation sales tax referendum that will be on the November 2014 Ballot. Just the very fact they felt the necessity to have a professional public relations campaign to push this effort should raise some serious questions in your mind. A similar effort in Hillsborough County failed a year or so ago. The Pinellas County Referendum proposes an additional 1% sales tax on all items except groceries and medical supplies. · Bus Rapid Transit lines on most major Pinellas corridors. You can look at your property tax bill, its probably lying around the house right now, and check the amount under "Suncoast Transit Authority" and see how much you currently pay to support the Transit system. In my case for 2014 it is $25.37. So as soon as I have spent $2600 on sales taxable goods and services, I will now be experiencing a tax increase for public transportation. A $500 TV set will cost $5.00 more, on a $30,000 car you would pay $300 more in sales tax and so on. If you don't now own any real property, you start paying a new tax immediately. This is not revenue neutral tax, it is for most Pinellas County residents a tax increase. If you are fortunate enough to make $100,000 per year, this whole 1% sales tax thing may be an irritant, in the grand scheme of things you'll pay more, a lot more, but it likely won't affect you that much. However if you make $10,000 per year it could very well make the difference in what you actually can and cannot afford to buy. In reality a sales tax supporting public transportation actually attacks in a far worse way many of the very people it purports to serve. Something that should not be lost in this discussion. Is what we are going to get worth the tax burden? Taxes like theses almost never go away. Do we want to mortgage the future with a sales tax burden for transportation? How much will a 1% sales tax influence tourism, economic development and jobs? Will light rail, where the bulk of this money will ultimately go, be the best option for Pinellas County? Can the County put enough controls in the project to prevent the headlong rush to build a rail system that goes from where nobody is to where nobody wants to go? Can rock solid commitments be made that bus service will be the first priority until all of the proposed bus service goals are met? I'll look at some of these over the next few weeks. I am looking forward to your thoughts and comments. For the record, I am a strong supporter of public transportation. I fully realize it must be tax supported. Before the public agrees to tax itself and hand over 100's of millions of dollars to support public transportation, there must be some controls and guarantees, that this won't quickly become a light rail money pot.